How did Pausa Art House come into being? My wife Lázara and I opened PAUSA last March. For a long time, we had been looking for a place where we could hear really great music of all genres – classical, contemporary, jazz, ethnic, original – played at a high level, not at a loud volume. We couldn't find that place, so we opened our own. Pausa Art House presents chamber music concerts and artistic exhibitions focusing on artists indigenous to Buffalo and its surrounding area. 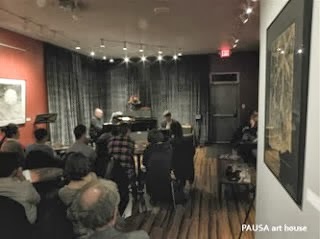 As a complement to the already vibrant nightlife on Allen Street, PAUSA adds a "boutique" entertainment element to the neighborhood with pre-concert and post-concert receptions that encourage intermingling among performers and audience members. 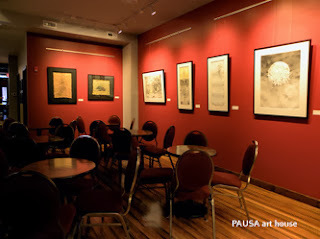 PAUSA is a gathering place for creative musicians, artists and writers, where a free exchange of ideas can take place. We believe PAUSA will support and enhance the cultural revival of both the Allentown district and Buffalo in general. We also seek to make PAUSA a destination for performers and audience members from outside Buffalo as well, in our effort to promote the creative activity that occurs here. We set our programs conceptually and independent of outside commercial forces. We also collaborate with The Center for 21st Century Music in the UB Music Department, Hallwalls, and Allentown First Fridays, building on an already strong local art movement. The relaxed atmosphere of the venue attracts patrons who wish to attend an intimate concert or art exhibit while enjoying a glass of wine. Arts are the primary attraction at PAUSA: audiences are intentionally small, to more easily return to the intimate origins of live musical experience. Within the focus of our artistic mission, we seek to achieve diversity through the presentation of artists who blur the traditional lines of categorization. 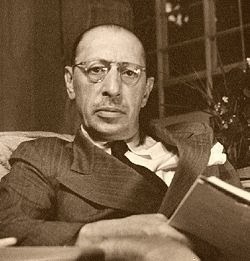 What is the nature of your and Lázara's relationship with PAUSA? PAUSA is truly a mom-and-pop business. Lázara takes care of all of the licenses and permits, accounting, purchasing, budgeting, Facebook, booking the visual artists, and updating the website. She bought the furniture on craigslist – working hard to beat out the antique dealers – and did all the painting in the club. I book the musicians, write and send press releases to the papers every week, and do other odds and ends as they come up. I painted the outside of the building (on a 28-foot ladder! ), and did carpentry work, hung doors, and installed the floors. We both do all the cleaning. Is PAUSA a livelihood for you two, a part-time job, a non-profit-making labor of love ... ? It's a labor of love that requires full-time attention. We survive by selling drinks and food at the bar. All door proceeds and ticket sales go to the musicians. We hope it will turn a profit down the road. What new and exciting things do we have to look forward to this year at PAUSA? We are starting a monthly Silent Film / Lively Music series, in which composers and performers will create scores to silent films. We're also bringing in out-of-town acts to do master classes at UB, then play at the club. We'll have the Cuban composer and percussionist Dafnis Prieto in September, and the Peter Evans / Sam Pluta Duo in November. Combining forces – composers and performers – is a great way to bring in folks who would not normally play in Buffalo. UB Composition students have a strong presence at PAUSA. Esin Gunduz and Zane Merritt are regular performers, and we present the music of student composers at the end of each semester, often in collaboration with our local new-music ensemble Wooden Cities. How long do you envision PAUSA going on? Do you have plans for eventual expansion or moving? PAUSA will go on as long as we can keep it going. No plans to expand or move. We are in for the long haul. Please give a thumbnail bio of your Music in Buffalo's Historic Spaces series. The Music in Buffalo's Historic Places series launched in March of 2013 with a fabulously well-attended concert of chamber music featuring UB faculty performing alongside Grammy-nominated violinist Jesse Mills in the Greatbatch Pavilion at Frank Lloyd Wright's Darwin Martin House Complex in Buffalo. This past May, we held our second concert featuring the JACK Quartet in the lobby of One M&T Plaza, the Minoru Yamasaki designed corporate headquarters of M&T Bank. Both events drew capacity crowds inspiring us to move forward with additional programming this year. The series originated from discussions I had with colleagues in the UB Music and Architecture departments concerning the value of showcasing the musicians (both visiting and UB faculty) in buildings of historic and architectural significance in Buffalo. Professor Felder's support and encouragement were essential in making the idea of the series a reality. Series sponsors have so far included the Center for 21st Century Music, Martin House Restoration Corporation and the M&T Charitable Foundation. Local piano dealer Denton, Cottier & Daniels generously donated the use of a 9-foot Steinway concert grand for our opening concert in March and will be doing so again for this season's two concerts. What is the mission of the series? To present high-quality music programming in places of civic, historic, and architectural significance in Buffalo. How long are you envisioning Music in Buffalo's Historic Spaces going on? I am currently working to expand the organization and resources of the series and hope to establish non-profit status and form a board of directors early next year. If the concerts continue to be successful, I plan to continue the series for as long as I am able! What new and exciting things do we have to look forward to this year in the Music in Buffalo's Historic Spaces series? On Sunday, December 15th at 3 pm in the Greatbatch Pavilion at the Darwin Martin House Complex, we will be presenting pianist Christopher Guzman in recital. Chris was the Grand Prize winner of the 2012 Orléans Piano Competition, Europe's premiere competition for pianists interested in 20th and 21st century music. Fresh from a recent European concert tour, he will present a program of solo piano music by Beethoven, Brahms, Henze, Liszt, and Widmann. Frank Lloyd Wright drew direct inspiration from Beethoven and the Germanic musical tradition for his groundbreaking designs. This program presents older works by Beethoven, Brahms, and Liszt, with more contemporary offerings that are inspired, in part, by music and operatic voices of the past. 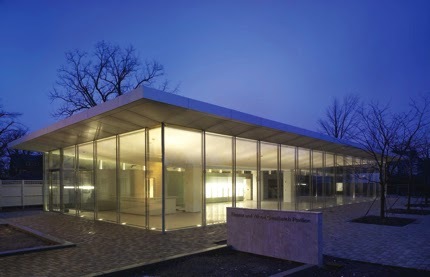 The program offers a musical parallel to the experience of viewing the Martin House – Wright's early 20th century Prairie-style masterpiece – through the glass walls of the modern Greatbatch Pavilion. 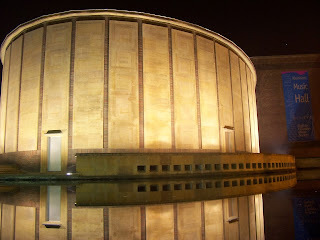 On Thursday, April 3, 2014 at 7:30 pm on the main stage of Kleinhans Music Hall we will feature music of the late Italian modernist composer Luciano Berio. UB performance faculty members Jonathan Golove, Eric Huebner, Jean Kopperud, Jon Nelson, and Yuki Numata Resnick will perform Berio's solo Sequenzas IV, VIII, IX, X, and XIV. 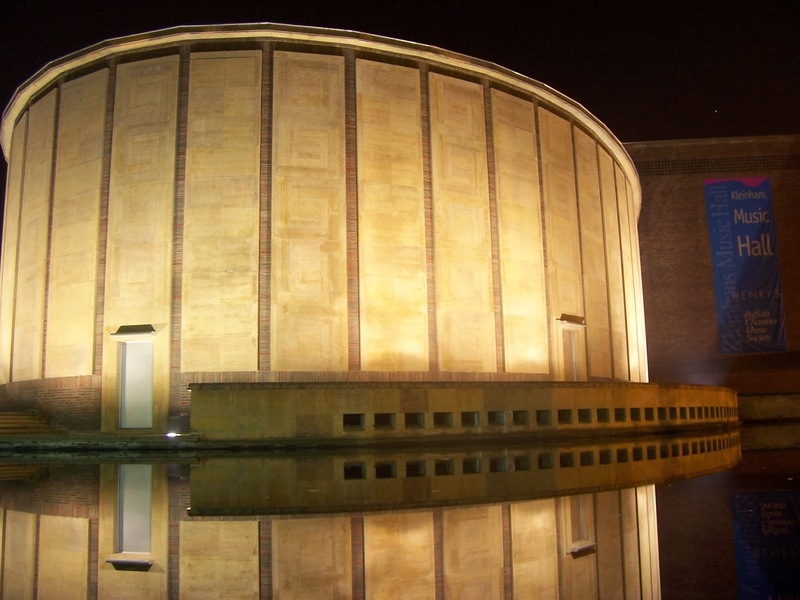 We plan to give audience members the opportunity to sit where the Buffalo Philharmonic members sit – on stage at Kleinhans – to witness up close the performance of these incredibly virtuosic pieces. Congratulations on having been a Tanglewood Music Center composition fellow this past summer! What drew you to Tanglewood, do you have personal history with it? I had participated in Tanglewood's high-school composition program through the Boston University Tanglewood Institute (BUTI) during the summer before my senior year (2004). My memories are of a really inspirational summer – surrounded by musicians, with access to world-class concerts pretty much ever day, and able to focus in on my composing. So I guess it's been a goal to be a TMC fellow for quite some time. And it was a really amazing experience. How many composition fellows were there this summer? Did you get a chance to hang out with any of them, make friends? I was one of six composition fellows. We all got along really well and were more or less inseparable as a group. We went to classes and concerts together, ate together, hung out together, etc. What was really remarkable and exciting about the group was that we were musically very diverse. Our writing styles were all quite different, but we still got along and were very engaged with each other's music. For example, in one project, each of us had to conduct a piece by one of the other fellows. I'm sure there are places where this wouldn't be the case, so it's definitely to Tanglewood's credit that they're interested in cultivating this kind of diversity rather than asserting one particular stylistic or aesthetic viewpoint. This is also something, by the way, that I value very much about the composition studio at UB. Were you satisfied with the premiere of been a cold long time? Rehearsals, performers, audience, the actual performance? Rehearsing been cold a long time was one of the highlights of my experience at Tanglewood. I was working with a group of incredible performers: Tammy Coil (mezzo-soprano), Cho-Eun Lee (piano), and Henrik Heide (alto flute). They all were very committed to the piece, and really threw themselves into the process. The rehearsals were coached by John Harbison and Dawn Upshaw, and I was really floored by their innate sense of musicality, and their ability to see exactly what I was going for in the music – without my having to say anything about it – and then help the performers bring that out. (I'll confess I was pretty star struck to be working with Dawn Upshaw.) Because we had ample rehearsal time, I also had the opportunity to make some revisions to the piece, which was very helpful. In the end, the performance was a big success – not just my piece, but the whole concert, which featured a world premiere of a song from each of the composition fellows. The other fun aspect of this project was that we were responsible for pairing each of our pieces with a pre-existing song from the repertoire. Tammy suggested our pairing – Im Wunderschonen Monat Mai, the first song from Schumann's Dichterliebe. The initial idea was that the "spring-ness" of the Schumann would be a nice contrast with the "winter-ness" of my piece. But in the end the dark, understated character of the Schumann actually matched my piece quite well. What are your plans for the next year or two? I have a very busy year ahead of me. At the moment I'm studying for my comprehensive exams, which will bring me one step closer to my doctorate. 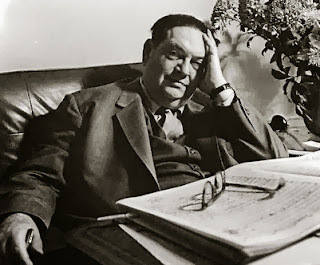 I also have two big writing projects on the horizon: a string quartet for the Arditti Quartet to play when they appear at UB in March, and a new large-scale work for voice and chamber ensemble which will be premiered by Oerknal, an ensemble in the Netherlands, in the late spring. I'm also teaching a class at UB for non-music majors on the music of Luciano Berio.